It's been a tough day, and there's a lot of work out there that needs to be done. I needed a bit of mental breathing space, and so I decided to do something that I enjoy: writing about physics. In particular, I thought I'd explain why special relativity MUST be true. 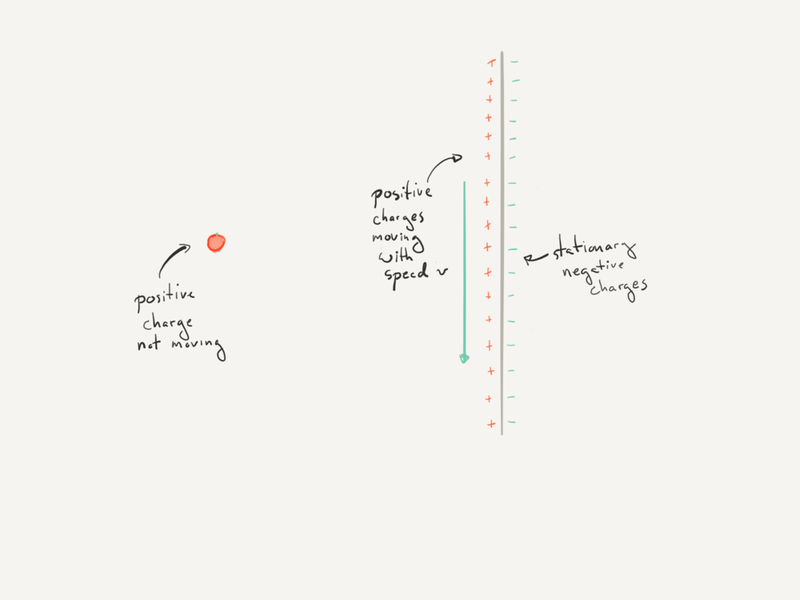 That is, why it MUST be the case that objects must appear contracted in length if they are moving relative to you (you can of course also demonstrate that time ticks differently for objects moving at different speeds, but I won't prove that here). Since electromagnetism is the underpinning of all our modern technology, we understand it really well. And none of it works without relativity. Let's see how. I'm going to construct a thought experiment. It doesn't matter that it's a very unusual situation; all that matters is that it is possible and therefore must be physically consistent. 1st, let's see how electromagnetism works. Charges create electric fields. Positive charges have fields pointing away from them, negative charges have fields pointing towards. Moving charges create magnetic fields. The orientation of those fields "wraps around" the motion of the charge (the fields are "out of the page" here, which is tricky to draw). 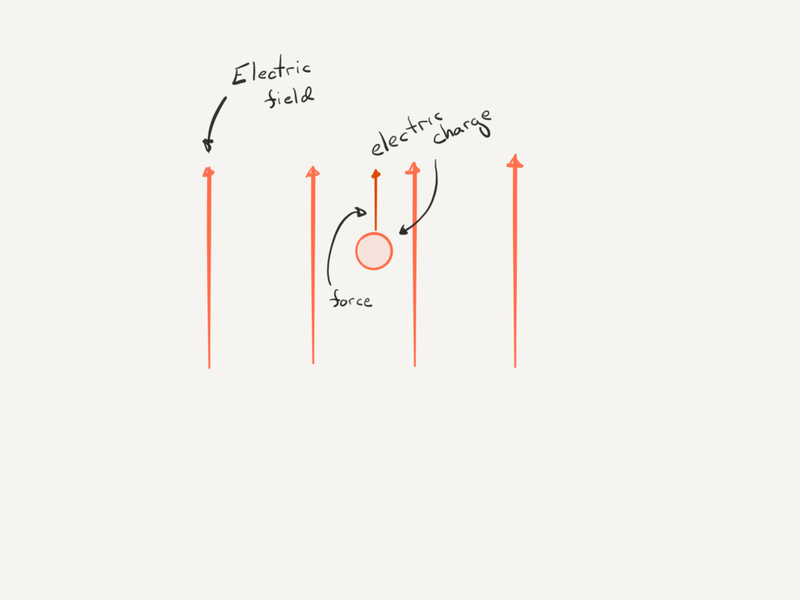 In the presence of an electric field, a charge feels a force. Positive charges move "with" fields, negative charges move "against." 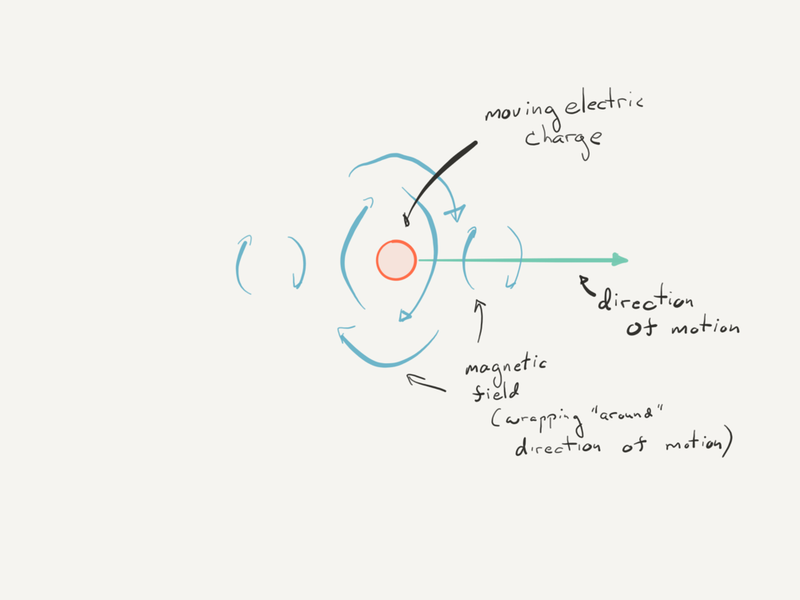 Moving charges in the presence of a magnetic field feel a magnetic force. The force is perpendicular to both the field and the direction of motion (out of the page here). So, if we have a piece of metal, it is made up of equal numbers of positive and negative charges in a given length of wire. The negative charges move if there is a current, while the positive charges stay stationary. Since there are equal positive and negative charges, the electrical fields cancel. 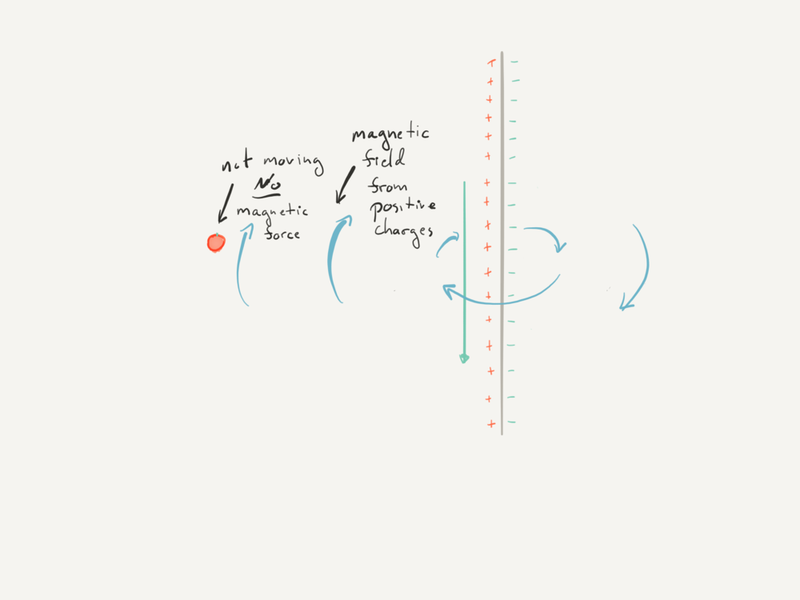 Since there are moving negative charges and not positive, there is a net magnetic field. 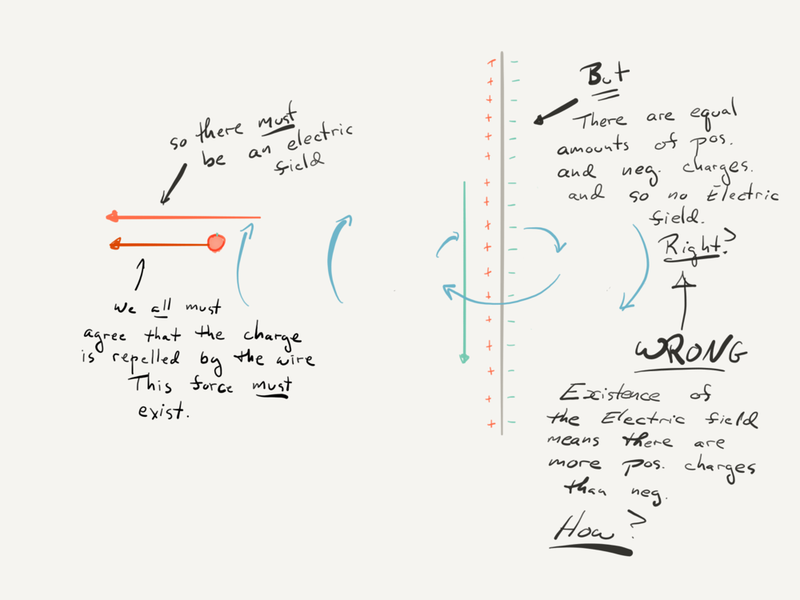 So here's the thought experiment: a positive charge moving next to a wire. We imagine the negative charges in the wire move at the same speed as the positive charge. This results in a magnetic force on the charge, and as a result the charge moves away from the wire. Now, let's imagine what happens if I run alongside the charge at the same speed as it. I'm doing nothing physically to the set up, I'm just changing my frame of reference. Now I see both the single charge and all the negative charges as stationary, relative to me, and the positive charges in the wire moving backwards. Those moving positive charges create a magnetic field. 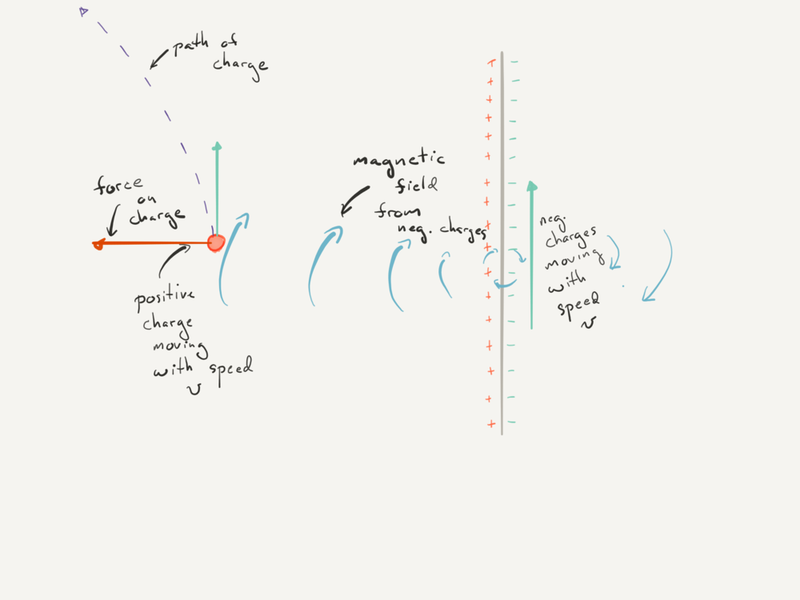 But since the single charge is now not moving, it feels no magnetic force. However, we know that the charge must be repelled from the wire. It was in the 1st frame of reference, and I haven't changed the situation at all - just my frame of reference. So there must be an electric field, point away from the wire. But where could that field come from? When you eliminate the impossible, whatever remains, however improbable, must be the truth. The electric field must exist, so there must be more positive charges on the wire. Somehow. The answer is relativity. The only way this all works is if length contraction exists. A moving object appears shorter than when it is stationary. So, the positive charges on the wire were stationary in frame 1. When we run past them, they appear contracted: more positive charges per length. The negative charges were moving in frame 1. So when we move along with them, they are stationary, and are dilated: fewer charges per length. So this is what the wire must look like when you run along with the negative charges flowing through it: more positive charges per length than negative. This creates a net electric field, and the positive charge is repelled. This is the only way everyone can see electromagnetism working, regardless of how they are moving through space. The result is very counterintuitive. But the logic is actually very simple: either electromagnetism doesn't work or special relativity is true. Lengths must contract otherwise some people would see a charge repelled from a wire and others would not, and that's not logically possible. So: length contracts (and if you examine the situation in more detail, you can show that this implies time dilates).